Is Coconut High in Cholesterol? You'll only get cholesterol in your diet from animal-based foods. Coconut is naturally free of cholesterol, whether you have raw coconut meat, coconut milk, coconut water or coconut oil. The controversy behind the link of coconut and cholesterol, however, lies in its saturated fat content. Unlike most other plant foods, coconut is very high in saturated fat, which, in turn, could have an effect on your blood cholesterol levels. Diets high in saturated fat are linked with a higher risk of heart disease. Saturated fat is known to increase low-density lipoprotein -- the "bad" cholesterol. When LDL builds up in your blood, it sticks to the inside of arteries, causing them to become hard rather than pliable warns the American Heart Association. Your heart works harder to keep blood moving, adding unnecessary wear and tear on your heart muscle. Because of the dangers, the publication Dietary Guidelines for Americans, 2015-2020 states that fewer than 10 percent of the calories you consume should come from saturated fat. If you follow a 2,000-calorie diet, have no more than 200 calories from saturated fat, or 22 grams, each day. Saturated fat is increasingly harmful if you also have a lot of cholesterol in your diet. So if you eat meat, poultry or dairy foods as well, aim to get less than 300 milligrams of cholesterol daily. The majority of coconut fat content is saturated fat. If you have 1/2 cup of raw, shredded coconut meat, you'll get nearly 12 grams of saturated fat, according to the USDA National Nutrient Database. Even a small 1-tablespoon serving of coconut oil has around 12 grams. That's more than half of your saturated fat allowance for the day, based on 2,000 calories. You'll get more than double that amount from 1/2 cup of coconut milk, making you go overboard on your saturated fat limit. Coconut water is the lightest variety, giving you less than 0.5 gram per cup. While coconuts and coconut liquids are full of saturated fats, not all of it is bad for you. Much of the saturated fat content is lauric acid. This beneficial saturated fat can actually help boost your high-density lipoprotein, the "good" cholesterol that reduces your risk of heart disease. HDL cholesterol tends to bring LDL molecule levels down, by transporting them to your liver for deconstruction and removal. But the maximum amount of lauric acid from coconuts you can have before it stops being beneficial is unknown, the Harvard School of Public Health warns. Because too much saturated fat in general is harmful for heart health, don't go overboard on your servings of coconut products. Coconuts have lots to offer in the nutrition department — in the meat, in the milk and in the coconut oil. Add a form of coconut to your diet and receive the wide variety of vitamins and minerals that will contribute to your health. 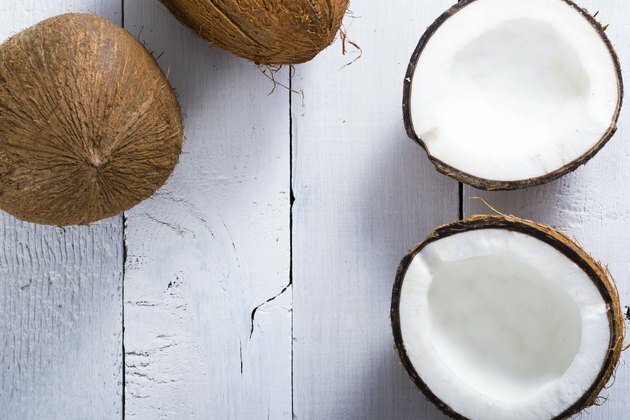 Livestrong.com: Is Raw Coconut Fattening?